Finally all the facts, dates, and stories are together in one place. We love our book! Can a family-owned company show the way to a new business model — actually a very old model — based on fiscal discipline, technical innovation, customer service, environmental stewardship, and the long-term good and welfare of employees? Anyone who has ever been part of Dempsey Uniform & Linen Supply knows the answer is a resounding “yes.” But many didn’t know the whole story until this book. It’s the first-ever history of Dempsey, an industry innovator and leader recently honored as one of the Best Places to Work in Pennsylvania and Northeast Pennsylvania’s Green Business of the Year. 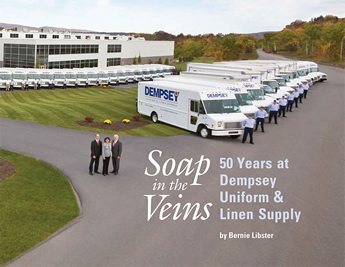 For more about the company, visit www.dempseyuniform.com. “…the narrative and photos combine to create interest, and to tell a genuine story. 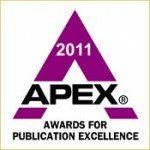 This is not corporate PR fluff.” Of the 3,300 Apex entries in 2011, only 100 received Grand Awards. The cover, which wraps around the book, is a story in itself! Dempsey came up with the idea and photographer Guy Cali took the shot from a crane. Lining up the vehicles took two hours. Drivers posed by their vans in order of tenure, with company principals center stage. The concept was inspired by a 1935 Mother’s Laundry photo (a predecessor company), which opens Chapter 1. 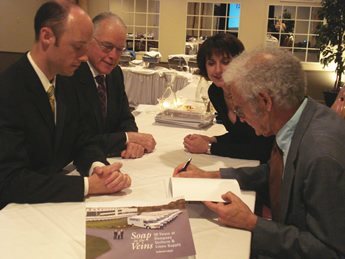 Author Bernie Libster signing books for PJ Dempsey, Patrick Dempsey, and Kristin Dempsey.